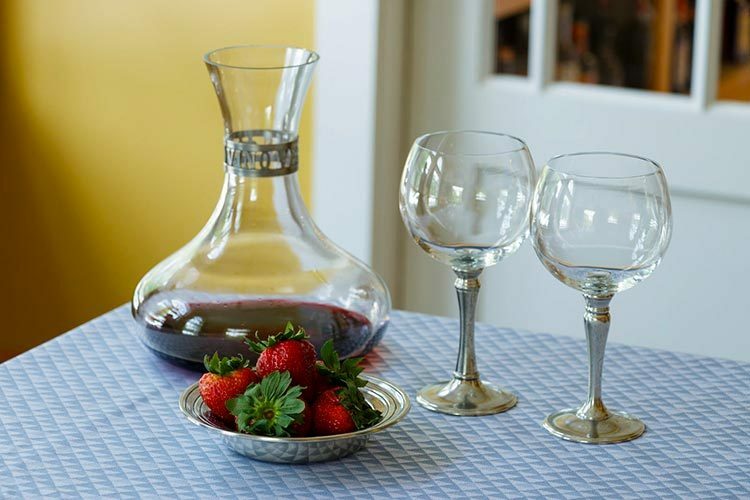 Decanting: Yes or No? Decanting: Yes or No? We’re sitting in the Còlpetrone tasting room when I ask the question. It’s a beautifully designed space – marble countertops, bright, open air feeling, thanks to the plentiful windows overlooking the Umbrian countryside, alongside various hues of natural wood. It echoes the modern, state-of-the-art feeling I got touring the winery’s backstage area, as if no expense was spared to show that this winery is with the times, on the cutting edge. But back to my question. Even though I had already visited several wineries in the area, and this debate is often on my mind when discussing wine, for whatever reason I asked Còlpetrone’s Marco Castignani first. Maybe it was the huge flavors of the 2010 Sagrantino di Montefalco. Perhaps it was the fact that we were comparing a 2006 “Sacer” Sagrantino with the 2010, and the ’06 was, amazingly, tighter. Do you typically decant these wines? Fast-forward a few weeks; I’m back home in the US. The Montefalco Consortium is holding a virtual tasting via UStream. There are tweets and chats going on, people all over asking questions as the winemakers taste through and discuss various aspects of Sagrantino. Someone participating in the chat asks the question. It’s reasonable to ask. Pretty much anyone who does would decant Sagrantino, the most tannic of all grapes, especially when young, fierce and possibly unyielding. I’ve heard of people decanting them all day. But what do the winemakers do? As soon as the question was asked, Marco’s smile emerged. He shook his head. I had to wonder if he was recalling our recent conversation. He looked to his right, however, seeking out a fellow participant to save him from having to, perhaps, repeat himself. Liù Pambuffetti jumped in. She had a similar opinion – that it’s preferred to spend time with the wine as it evolves, in the glass. She discussed how much she enjoys following a wine over several days, seeing its progress, how it will evolve and open. The other winemakers at the table nodded in agreement. It’s a very winemakery answer. If a bottle is going to be consumed in one sitting, should it be decanted? There’s a reason I described the Còlpetrone winery the way I did, in the first paragraph. All throughout my Umbrian visit, I noticed how much the winemakers and wineries knew about the latest technology in winemaking. Some are more, shall we say, rustic than others, while some are slick and polished, but the winemakers themselves are all keenly aware of the latest tips and tricks, the proven ways to make the best wine from superior grapes. When it comes to serving and drinking wine, on the other hand, Montefalco seems more conservative. Umbria in general is known as a place that’s slow to change, it being the only region in all of Italy that’s neither bordered by water nor another country. They do things the old way here. Which may be why everyone shuns those hoity-toity decanters. I walked into a wine shop in the center of Montefalco, on a 90+ degree day in September. The room was not air conditioned. I noticed that the finest wines – the pricey Sagrantino, the older vintages, were all stored on top shelves, out of reach from grabby tourists. But how long have they been there, I couldn’t help but wonder, steaming in this heat? Though these temps were out of character for mid-September, it was just recently August, and July. This was the norm. And these brilliant wines were likely taking a beating. Another night, we dined at one of the town’s finest restaurants. Housed in an old stone building, it seemed like the type of place that’d have a natural cellar perfect for wine storage. But our bottle of Sagrantino arrived warm to the touch, the product of another humid night and open flames in the kitchen. Europeans sometimes shake their heads at Americans with all our wine refrigerators, but most of us don’t have old, naturally controlled cellars to take advantage of. We should all be able to agree, however – thanks to UC Davis studies, among others − that wine ages far faster in warmer temperatures, and that it just doesn’t taste as good when it’s served warm. Does this have anything to do with decanting? Maybe it’s conceptually the same, the old way versus the new way. In this case, however, there’s no definitive study that proves the worth of decanting (or lack thereof), so instead the debate rages on, in tasting rooms, message boards and blogs like this. I’m not sure I got any closer to an answer in Umbria. Personally, I am a believer in decanting, especially for young, bold wines like Sagrantino. Though there isn’t any scientific backing, based on my own anecdotal evidence, it helps the wine open and develop more complexity. Do you decant? Let us know in the comments.